We've just placed our stock order for the new LED puck lights from WAC Lighting. We've had one on display for a while, but now think the time is right for us to have them on hand! I think their color quality and brightness are gorgeous! You'll have to come visit us, check them out, and tell us what YOU think! 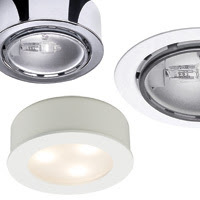 We'll have them in Brushed Nickel, Copper Bronze, and White, with dimmable drivers. A single shot of the bronze puck. This is just the driver, which I know isn't pretty, but people often wonder what the "driver" looks like! We're going to start by stocking a 4-light dimmable and a 1-light non-dimmable. You'll have to let us know if you think we should stock other versions! This is a retrofit unit that we aren't stocking yet, but I thought I should note that it exists! This will change out an existing WAC halogen or xenon puck over to a new LED puck.